The size of small dogs can be pretty deceptive when it comes to their grooming. While it is easy to assume that they may require less grooming, it’s only after they get one that most pet parents realise the magnitude of this task! Now before you get nervous about the whole process, read on to know how you can groom your small breed dog in the comfort of your home! Research has proven that a earbud can be the worst thing ever to clean ear wax. If anything, it only pushes the wax inside worsening the condition. Thus, steer clear off a earbud when it comes to removal of wax. So what do you do? You need not start considering “local dog groomers near me” immediately as a cotton ball soaked in a ear-cleaning solution can do the trick just rightly. Just ensure using different cotton balls for each ear. One handy tip to curb the growth of ear wax is putting cotton balls in their ears during a bath. A sign of clean and healthy ears is them being light pink in colour devoid of any smell! If you have a pet dog with adorable wrinkles on his face, like a Pug or a French Bulldog or you are just looking for help on how to groom a Maltese face, you can reach out for an earbud or a washcloth! Although small in size, the faces of such dogs require extreme attention when it comes to grooming. Cotton can be extremely handy if you’re contemplating how to groom a dog face as it is the softest on cleaning not only wrinkles but also the eyes. 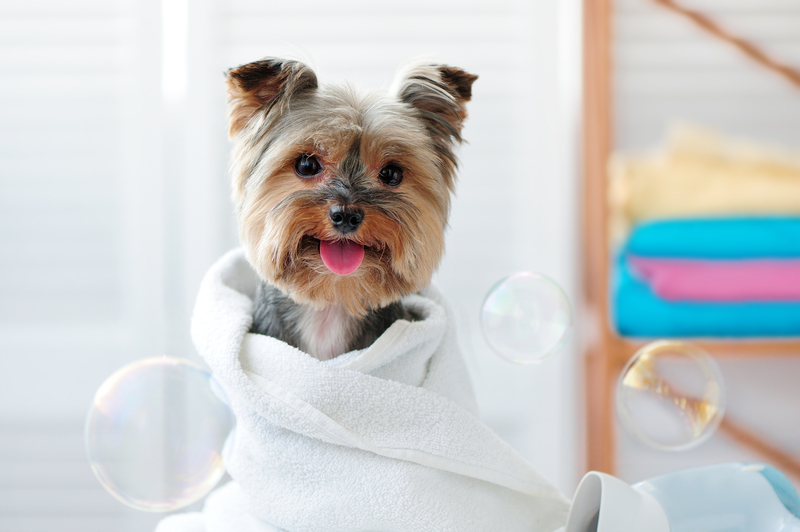 An unavoidable step in grooming a pet, there’s actually a lot of detail that bathing requires. One of the most helpful advice on dog grooming for beginners when it comes to a bath is using tearless shampoo. It’s best to use shampoos that are particularly curated for pet dogs as using a shampoo made for humans can cause skin irritation and dryness owing to its high acidic content. And just as you would on yourself, don’t forget that conditioner to ensure a tangle-free, easy to comb, shiny and irresistible-to-touch coat! Last but not least, you don’t want to be scratched by your pet dog after awaiting a cuddle with him at the end of a long day! Clipping nails is necessary not only to keep a check on their length and sharpness but also curb any bacterial growth! If you would prefer, you can search for “small dog grooming near me” and talk to someone or simply watch some videos online to get some know-how about it. Nothing about it is rocket science! Doing the above-mentioned steps at home can sure make your pet look like a million bucks for sure. To get a fair idea about how to go about it, you can also resort to the world wide web that’s abundant with how to groom a dog youtube and even a fair bit of professional dog grooming videos. So go on, pick a day to indulge your pet, he sure deserves it!